I have a friend who likes to loan me sad books, and when I finish one and say “OMG that was sad!”, she’ll say, “I know, but wasn’t it SO well written?” I have a feeling that my friend and KatSings would get along well. My Book Exchange buddy got me this lovely, sprawling book, which is beautifully written and has an air of pervasiveness melancholy about it. I adored it anyway, and I appreciate that KatSings got me to read something that would not otherwise have made it to my radar! This book spans generations. When a four-year old girl is discovered abandoned on the docks after an English ship arrives in Australia in the early 1900s, a tender-hearted shipmaster takes her home. On Nell’s 21st birthday, her father tells her the family secret, and suddenly her sisters aren’t her sisters, and her parents aren’t her parents. Her quest to find the truth continues on, finally ending with her granddaughter Cassandra. The story covers multiple time periods: Nell’s biological family and their various tragic childhoods, Nell’s semi-tragic life after having her identity uprooted, Cassandra’s drifting life after her own tragedies happen. There’s a LOT of tragedy, is what I’m saying. But the characters are delightful, and the mystery is engaging, even if you know there are going to be sad endings for a lot of the people involved. As Morton drops more and more clues, you start to figure out how it all is coming together, but the journey isn’t rushed. Bad things happen to people, good and bad alike, and the choices made to deal with those things can have huge, lasting effects. The choices forced upon these characters can sometimes make your heart ache, even as you understand why they’re choosing those paths. P.S. 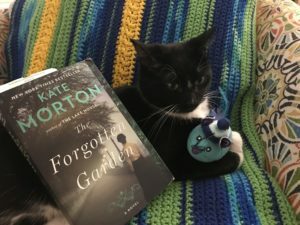 There’s a funny little throwaway scene about Frances Hodgson Burnett getting inspired to write the Secret Garden due to a garden on a family estate, and as a lifelong member of the I <3 Dickon fan club, I was tickled. Share the post "A beautiful, melancholy story from my Book Exchange buddy"
Eliza Makepiece is the most inspiring creative I’ve read about in a long time. I wish my brain worked like hers!